Shepherdess wrote: The new update scared the crap out of me until I went "Awww!" Nothing says love like the gift of a trébuchet. Trebuchets are forever. Sand castles most certainly are not. htom wrote: It's is the contraction of "It is". Its is the possessive of it. Not if It is the name of a person. E.g. : "That is It's book" or "Who's that cursed hat?" "It's It's". That is its book. You've written "That is it is book." It's its. You've written "It is it is." Sorry. It took me years and a good secretary to learn this. edit -- messed up the quotes. I think you didn't get the point. I know the difference, but I used It like a noun. Try substituting It with Jack to understand what I mean. I think you didn't get the point. I know the difference, but I used Jack like a noun. Try substjackuting Jack with Jack to understand what I mean. I should have used Meredith instead of Jack while we're talking about recursion. Except perhaps the gift of two trébuchets. That is better. Hmm. Correction: Nothing says love like the gift of recursive trébuchets. No, they're* talking about someone like Cousin It, in which case, yeah, that would be It's book. About the cursed hat, though, did you mean "who is that cursed hat? ", or "whose is that cursed hat? ", i.e. "to whom does that cursed hat belong?" Any way you slice it, though, it's still me** and mine. ** properly I, I know, but who really says that? Ok, that was actually wrong. I meant whose. EDIT: and I think it's actually "it's still me", since the subject is "it" and not "me". On the other hand, I'm italian and they don't teach english too well here. The predicate of a copula is in the nominative/subjective case in at least most languages, including English. But, in casually spoken English, we often use the accusative/objective case anyway. has no one linked to this comic yet? http://www.xkcd.com/878/ seems apt. You can't build a model in a model. No nesting. Last edited by eight on Fri Apr 05, 2013 10:53 pm UTC, edited 1 time in total. I think if someone gave me a tiny trebuchet for my tiny sandcastle, I would marry them on the spot. You know, I think I'd do that too. Even computers are capable of love under the most extreme circumstances. eight wrote: has no one linked to this comic yet? 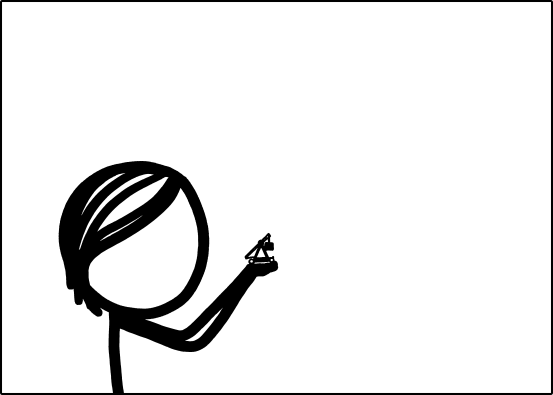 http://www.xkcd.com/878/ seems apt. You can't build a model in a model. Actually it has been quoted several times. Wow, did not expect a screamer at this point in Time. And this is my call for coma. School sometimes perpetuate rules we no longer need. Do not give in, my brother. That tint trebuchet is soooo Adorable! This is also a Most auspicious occasion and president breaking, the zoom in is the most change in frame since the beginning of time! My heart is beating right through my chest. I fee joy, rapture, a renewed sense of hope, a quickening in my breath, a tightness in my chest ... A tingling in my left arm? Someone pass me my nitro glycerine! Quick! Last edited by AionArap on Fri Apr 05, 2013 11:08 pm UTC, edited 1 time in total. eight wrote: has no one linked to this comic yet? http://www.xkcd.com/878/ seems apt. You can't build a model in a model. No nesting. Shepherdess wrote: I think if someone gave me a tiny trebuchet for my tiny sandcastle, I would marry them on the spot. Of course, if the water keeps rising, you may need scuba gear to marry them on that spot. kryton wrote: That tint trebuchet is soooo Adorable! I think the comic could end right there, and I'd be satisfied. Arë thëy reënacting thë trébuchet battlë fröm eärliër? Alsö, my ümlaüt keÿ ïs stück ön för somë stüpid reäson. Sorrÿ. Last edited by Elmach on Fri Apr 05, 2013 11:15 pm UTC, edited 1 time in total. Only when using it as a pronoun. When It is a proper noun (e.g. referring to the Psammead in http://en.wikipedia.org/wiki/Five_Children_and_It), the correct possesive is "It's". It's not a proper noun in that context, just as "he" is not a proper noun if it refers to Joe. In Five Children and It, the Psammead is described as having “eyes [that] were on long horns like a snail’s eyes, and it could move them in and out like telescopes; it had ears like a bat’s ears, and its tubby body was shaped like a spider’s and covered with thick soft fur; its legs and arms were furry too, and it had hands and feet like a monkey’s” and whiskers like a rat. When it grants wishes it stretches out its eyes, holds its breath and swells alarmingly. No use of "it's" or "It's" as a possessive. There could be someone named "It", I suppose. Cousin Itt in the Addams Family might be an example, but Itt's name is not spelt "It". The Psammead, above, is not named "It", but it is called "it". This is one of those many traps in English. "It's" is either a contraction for "It is" or "It has", depending on context. It is rarely (never?) a contraction of "It was". It is one of most frequent errors in written English. I tried some unsharp masking magic on that zoom. I think it's improved and clarified somewhat. comic number #404, perhaps this is the end? OK, You win for time, but mine is in 3D! azule wrote: KarMann, that would be Cousin Itt. 2 t's like your 2 n's. In that case, substitute psychopathic clown demons for squeaky-voiced hypertrichosis patients. You scare me. I wish I knew how to take this. The Megan and Cueball we've been watching all this time are actually miniaturized people who are building their sandcastle on top of an actual (larger) sandcastle that looks just like it. It's sandcastles all the way down. Except for the vowels I have bolded for you. Intermittent problem, or fake problem? EDIT: P.S. I think the mini tree-bucket is just about the cutest thing ever. Next to my bunny with a hat, that is! Last edited by buffygirl on Fri Apr 05, 2013 11:39 pm UTC, edited 1 time in total. Hey dawg, I heard you like sandcastles and trebuchets, so I put a sandcastle on your sandcastle so you could hit sandcastlies with trebuchets while you hit sandcastles with trebuchets. Also, the recursion has gone out of control. well I didn't because i wasn't here, but i'm sure everyone else did. Right guys? Here is a song about the difference between 'its' and 'it's'. I think I found a solution for the its/it's conundrum. Use "It be" and "their" (or one of the other gender-neutral alternatives)! On a side note, I think cueball's sentiments echo my own exactly, on the topic of the tiny trebuchet. Angelastic wrote: Here is a song about the difference between 'its' and 'it's'. I chose a good time to make my return. Mini-trebuchet!! !